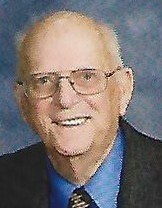 Larry Paul Myers, 81, of Mount Vernon, Illinois went to be with the Lord at 7:40 A.M. February 3, 2019 at his residence in Mount Vernon, Illinois. He was born February 17, 1937 in Mount Vernon, Illinois to the late Basel Clayton Myers and Velma (Byars) Myers. He married Janet Ruth (Daily) Myers on November 24, 1962 in Mount Vernon, Illinois. They were blessed with 56 years of marriage. In addition to his wife, Janet Ruth (Daily) Myers, Larry is survived by his three sons, Brian Myers and wife, Connie of Lake Villa, Illinois, John Myers and wife, Kathy of Mount Vernon, Illinois, and Jeff Myers and wife, Robyn of Glenarm, Illinois; grandchildren, Evan, Sara, Nolan, Noah, Caleb, DaCoda, Ali, Nathaniel, Megan, Brandon, Braydon, Bryson, and Aaron; sister, Sharon Myers of Dix, Illinois; and several nieces, nephews, and cousins. Larry proudly served in the Illinois National Guard. He was a past president of the Woodman of the World Lodge #202. He was a long time member of Logan Street Baptist church. He had served as the Sunday school director. Larry was a firefighter for twenty years for the City of Mount Vernon. He was affectionally known as “Moe” by all his fellow firefighters. Larry will be missed by all who knew him. The visitation will be held from 5:00 P.M. to 8:00 P.M. Wednesday, February 6, 2019 at Hughey Funeral Home in Mount Vernon, Illinois. A fire department walk through will begin at 7:00 P.M.The funeral service will start at 11:00 A.M. Thursday, February 7, 2019 at Logan Street Baptist Church at 800 North 42nd Street in Mount Vernon, Illinois with Mr. Joe Bob Pierce officiating. Interment will then follow at East Salem Cemetery in Rural Jefferson County, Illinois. Memorials may be made to Logan Street Baptist Church Day Care.